Mother came from a rather rigidly structured family, conduct-and/or deportment-wise. From my personal perspective, both parents were old-English vintage: steady, steadfast, punctual, mature, spotless of mind and body, patriarchally/matriarchy demanding–and equally paternally overflowing with love and devotion to the welfare of their children. Their daily activities centered around petitions of faith to that Eternal of, and to, whom we of the LDS-faith recognize and humbly render obeisance. Certainly, as regards Mom’s young womanhood, there could no uncertainty as to her wholesomeness come into question; and it was on this basis that Dad has expressed to me his courtship for her. A little excerpt, please, from one of his written comments to a granddaughter, Judy. 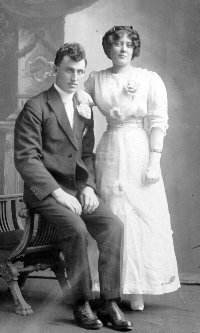 Ethel and I were born in the Grouse Creek Ward and grew up together and enjoyed the parties and dances together. It wasn’t long until we were drawn to each other and we were sure in our own minds we were meant for each other. It grew into a real love affair. I got a nice white top rig and a fine team and we went everywhere and enjoyed every event. Her mother didn’t like me because I wasn’t really religious. She tried to get her started with a returned missionary and he was willing but Ethel said, “Nothing doing.” As we went about we were pretty cocky and had a good time and loved each other dearly. It was not a problem of telling whether we were right or not. 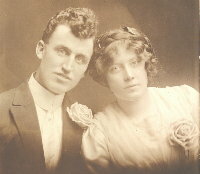 We were married on February 18, 1914, in the County Clerk’s Office in Ogden; by a minister named Jno V Bleuth. Grandmother Frost, too, suffered much anguish and frustration with the splintering of the family-timer (please excuse the aphorism). Regardless, her steadfastness that had maintained her through life’s vicissitudes surfaced and sustained her in the trials incident to liquidating the properties in the Grouse Creek valley. She retained her dignity, and though essentially estranged from her own sons and other living daughter, leaned toward the loving counsel and compassion of Mom and Dad. Of them all, it was she (and he) to whom Grandmother looked for ultimate assistance and direction; meaning, essentially, her departure-to, and welfare-while, living in Salt Lake City, and later, Brigham City. and it can handle whatever comes along. It takes its lumps and learns from past mistakes. small sacrifices and minor inconveniences. Class is comfortable in its own skin. It never puts on airs. who has class because he is comfortable with himself. As older brothers and sisters left-the-nest, a piece of Mom’s heart went with them. On the occasions of their brief return, her arms were open and she radiated with ebullience and endearment. As the brief visit would end, and a beloved would depart again, try-as-she-might, her grief slipped through. I came to know (Perhaps perceive is a better word. )when she was on her knees scrubbing the floors by hand, and polishing the linoleum with wax (whether they needed it nor not). Good, hard, work seemed to be her sanctuary–and it worked! (Well I remember such an occasion. Whomever it was that had departed, followed-on that awful lonesomeness that has been my Achilles’-heel. As I stood brooding at the window in the living/dining room, the lightening scorched, and the thunder crackled, as the rain gushed down the pane. The house was dark, cold, and gloomy. I knew that I felt poorly, but I didn’t understand why. There, on her hands and knees, was Mom, giving that floor a workout like you wouldn’t believe. At that time, I didn’t really understand.) As the years rolled on, my perspective broadened and I came to appreciate the meaning of such. Mondays were, always, wash-day. Earliest recollections have her standing over a tub full of hot water with an inclined scrub-board immersed therein. (“Rub-a-dub-dub, three men in a tub…” became a reality to me.) Washday or not, it was a favorite for me, ‘cause it was on these days that she didn’t take a lot of time to cook. Come noon-time and she would bring out the large bowl of bread-dough and cut off chunks to be flattened between her palms and then dropped into a pan of scalding lard (of her own rendering). No morsel since has the fond savor in my gustatory repertoire as that hot, golden fried-cake–slathered with butter and Karo syrup–put alongside a pile of brown-beans that had been simmering on the back of the cookstove. What a delicacy to me! I’m not sure that I know how to put this next excerpt in delicately. So, we’ll just “call an ace-an-ace and a spade-a-spade.” In this day and age, can you imagine what fortitude it took to pile out of a warm bed, stick your feet into some cold, damp galoshes, wrap a mackinaw around you, and step out into the knee-deep snow to get to the “privy” an appreciable distance away?…Unthinkable, now, right? By way of summation: I am indebted to Ernie for a most recent comment in one of his letters; I had overlooked a significant aspect of both Mom’s and Dad’s lives. His [Ernie’s] remonstration: “…I don’t think any history of Dad would ever be complete without the complimentary history of Mother.”…For sure! Likewise, with the other of our histories. If there is anything in them that depicts character, love, compassion, class, or ability, there-upon will you find Mom’s endorsement. Ethel died on July 28, 1968.